Lexus is launching its new IS luxury sedan using a wide array of high-tech experiments. 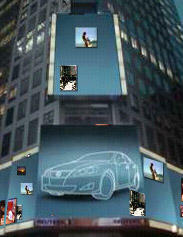 They are mounting a Time Square photomosaic billboard consisting of pictures people can submit through the website. They have also hired Kurt Wenner, an artist famous for his pseudo-3D street paintings (here's an earlier post on that). Finally, there will be a "full-sized hologram of the car at an interactive kiosk from which the user can rotate the car, change its color and choose to watch a 15-second driving sequence." All work done by Team One.